The London Olympics are less than 100 days away, and while some military athletes have already punched their tickets (and keep checking here for new Army qualifiers), the trials have yet to start in earnest. That changes this weekend in Iowa City. About 30 wrestlers with military affiliations will compete in the Greco-Roman and freestyle (men’s and women’s) tournaments to determine who’ll represent the U.S. on the mats. Click through for a quick guide for the once-every-four-years wrestling fan — the troops, the favorites, the story lines, the TV coverage and, of course, the flying squirrel. Troops to watch: According to the latest rankings from wrestling super-site TheMat.com, soldiers are ranked first in three weight classes, all Greco-Roman: 55 kilograms (Sgt. Spenser Mango), 66 kg (Spc. Justin Lester) and 120 kg (Sgt. 1st Class Dremiel Byers). Byers has earned a bye to the best-of-three finals in his division; Lester would’ve earned a bye in the 74-kg class after winning the U.S. Open at that weight, but likely will drop down to 66 kg and fight through the bracket event, called the challenge tournament. Byers and Mango both wrestled in Beijing in 2008, and Army Reserve Sgt. 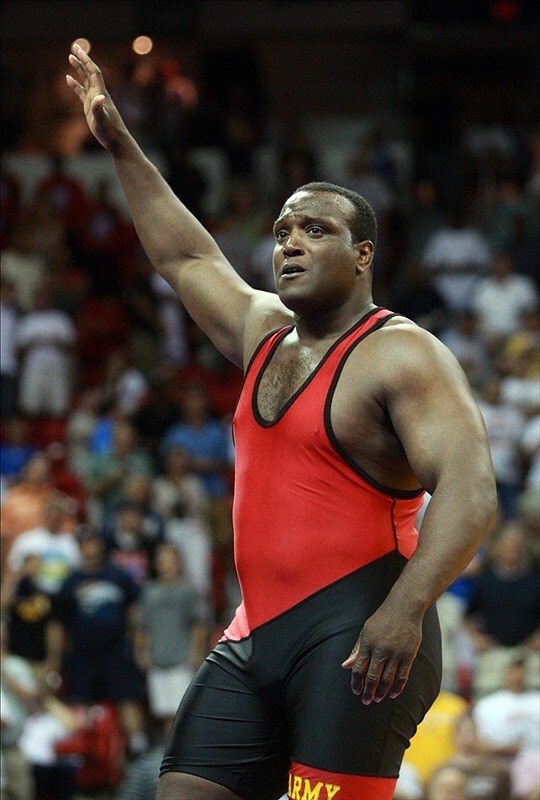 Oscar Wood, who wrestled in the 2004 Athens games, will compete in the 74-kg class. The top competition for these soldiers could come from their fellow service members — Staff Sgt. Glenn Garrison ranks behind Lester at 66 kg, Spc. Timothy Taylor ranks behind Byers at 120 kg, and 2009 national champ Spc. Jermaine Hodge ranks behind Mango at 55 kg. The rest of the best: For more on other military competitors, the folks at Army Family and Morale, Welfare and Recreation have an in-depth preview here. For lists of qualifiers, go here. Not all wrestlers who are qualified will compete, and even those who commit to the even must make weight. The story lines: Speaking of making weight, there’s Rulon Gardner, who’ll need to battle the scale before fighting through the challenge tournament at 120 kg to get a shot at Byers. Read more of his story here, including more than you wanted to know about his amputated toe. If Gardner makes weight, he instantly becomes the most well-known grappler on the mats in Iowa City. Two other wrestlers who could’ve claimed that mantle have already backed out: Cael Sanderson, the 2004 freestyle gold medalist at 84 kg, decided against a comeback, and 1996 freestyle gold medalist Kurt Angle — who since then has made the move to pro wrestling, which has yet to become an Olympic sport, for some reason — also bailed shortly before the competition. The nuts and bolts: Weigh-ins begin Friday, followed by seeding meetings. Wrestling runs on multiple mats for most of the day Saturday and Sunday. Only one wrestler per weight class can qualify for London if the class itself has qualified (the top military wrestlers are in qualified classes). Go here for the schedule, and here for a rules primer from our good friends at the Des Moines Register. How do I watch it? : NBC will offer an online stream, and the NBC Sports Network (formerly Versus) will have tape-delayed coverage. Wait a sec … “flying squirrel”? You’ve probably forgotten about Ellis Coleman, who made the SportsCenter highlights with this move last year. He’ll compete in the 60-kg Greco-Roman event, but he’ll have to get past Army Spcs. Jeremiah Davis and Marco Lara to reach London, as well as Marine Staff Sgt. Donavan DePatto. Read more about Coleman here.